Just over 200km south of Prague, this amazing looking structure allows visitors a unique view of the forest, it’s canopy and beyond. 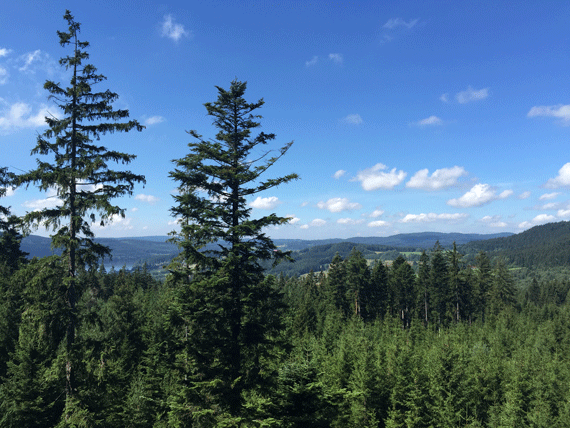 Views extend towards Lake Lipno (billed as Czech Republic’s inland sea), the Sumava Mountains and the Austrian border. It’s actually open all year round, but we happened to go mid-summer holidays when half the population of Czech, Austria and the Netherlands also turned up. 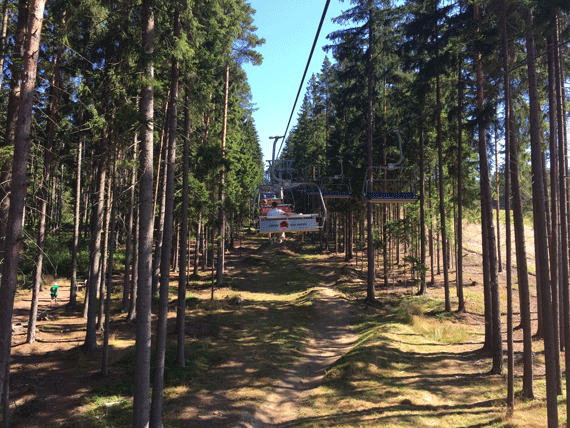 Tickets can be purchased at the Lipno ski resort cash desks, you must buy here if you choose to take the chairlift up the hill. 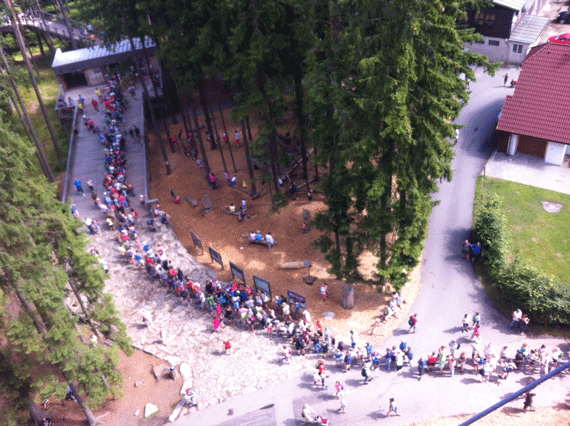 If you walk up the marked path to the top you can buy your entry ticket at the entrance to the tree walk. 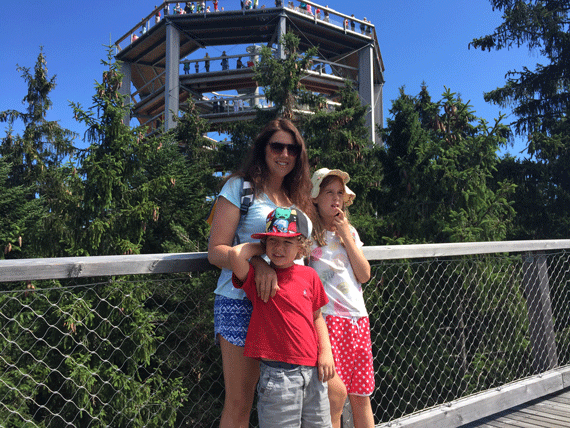 I can’t imagine any parents being able to convince their kids to walk up, our kids would have howled and whinged the whole way up as others sailed over our heads in the chairlift! We arrived at the top around 10.45-11.00am and joined a line of about 60 people. Realising that this line was also for ticket sales as well as entry, we were able to join a shorter line and just show our ticket so we only waited around 2 minutes. We were lucky, 20 minutes later the lines began to grow larger and 40 minutes later the lines were ridiculously long! 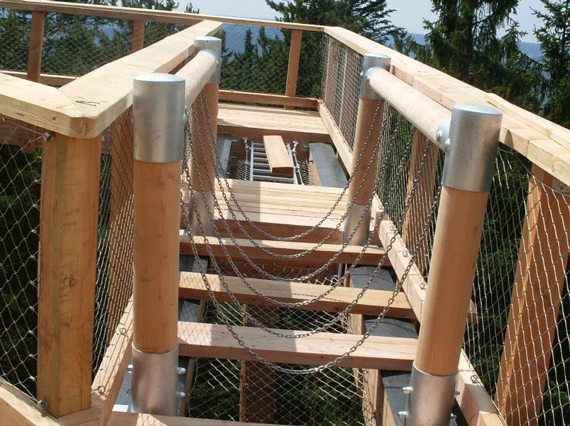 The tree top walkway gently guides you around and up amongst the trees, mainly conifers, they are just beautiful. 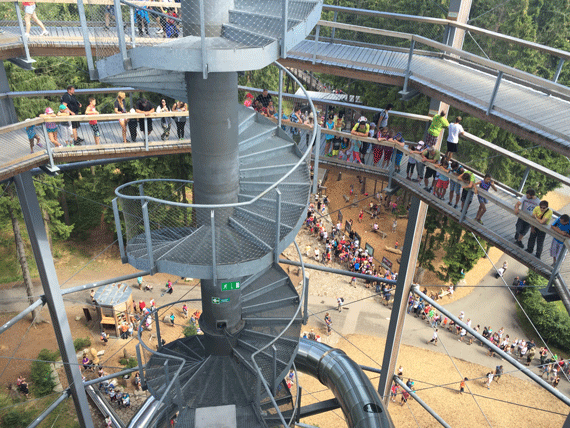 The walkway is 675 metres long and culminates into a large spiral tower 40 metres in height and 901 metres above sea level. The walkway is suited for prams and wheelchairs. There are two ways down, you either take the walkway back or you pay to go down the biggest slide in the Czech Republic. There are info boards and also some ‘fun’ balancing areas where you can suspend on balance beams, wobbly steps etc. above the ground with just wire netting to break your fall, my daughter managed to fall and test this area - it worked, all good!! 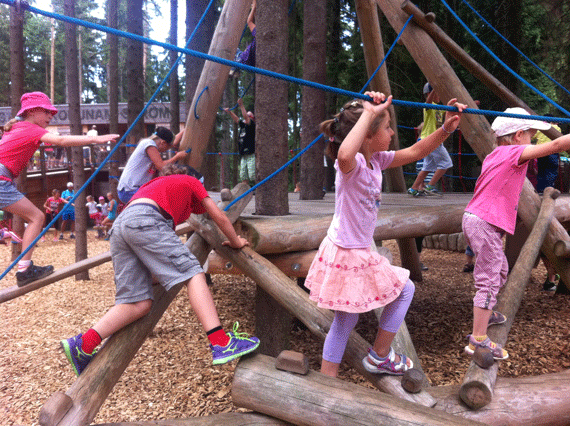 The kids wanted to try out all these balance areas which meant lining up each time behind about 30 people. Oh gawd, it was quite terrifing for me, i’m not good with heights and the crowds started to swell around us as the numbers grew. About half way up I started to realise that the walkway ‘sways or moves’ a bit. Ok, my Grandfather was a Civil Engineer so I know that they would have tested this structure over and over again but yikes we were now 20 metres up in the air! A mantra entered my head ‘Tower of Terror, Tower of Terror’ and I could not shift it. A forced smile remained on my face as well as a calm exterior to combat passing fear onto my daughter, unfortunately we both got quite nervy at the top and the husband saw through my act and found it very amusing - not helpful, thanks! So after a few photos me and my daughter bolted back down the ‘gently swaying’ path as even more and more people made their way up. Now look, this thing is safe, it’s been operating for over 4 years, I have an irrational fear so don’t let me put you off. The crowds did it for me, if we’d gone earlier, in spring, autumn or better still in winter, it would have been perfect. I was excited to go on the Giant Slide ride which takes you right to the bottom. 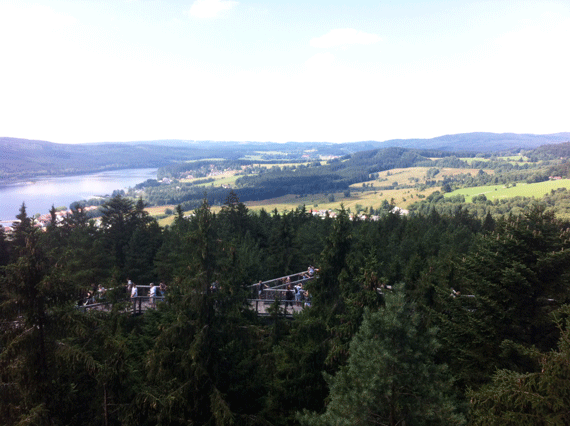 It’s the longest slide in Czech Republic at 52 metres! Unfortunately there were about 150 people waiting to get on and I couldn’t wait up there any longer, for my sanity, I had to get down. Once day I will! 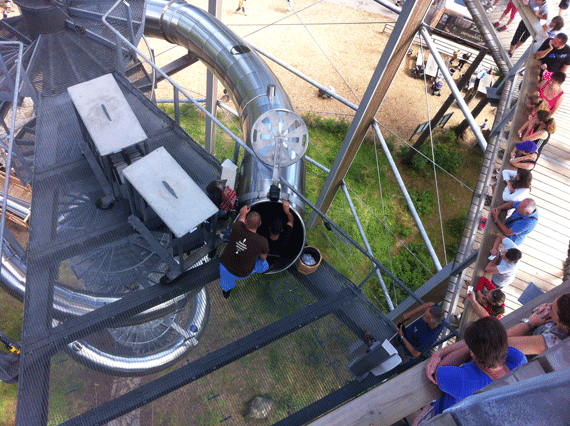 Rides cost 50czk per person, you can pay on the spot or buy at the entrance to the walkway. Kids must be at least 6 years old to ride. The operator helps you into a sack and pushes you off on your journey. Back on solid ground my son played in a pretty cool little balance and ropes playground whilst husband and daughter joined another long line for ice-cream, it only took 20 minutes!! Keen for space, fresh air and nature we headed down the hill into a far off, remote corner and then bush-bashed some more into pristine mountain forests. 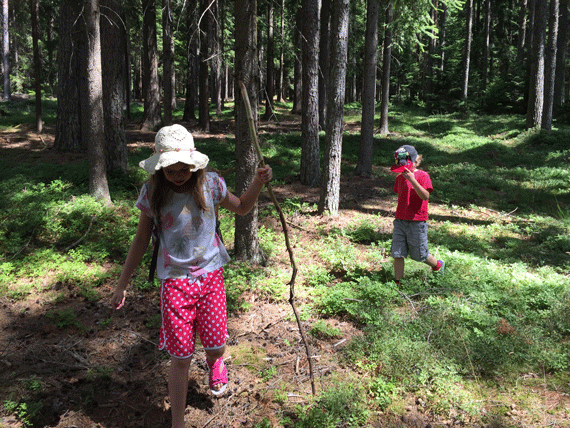 There was no one in sight and we found massive amounts of wild blueberries. 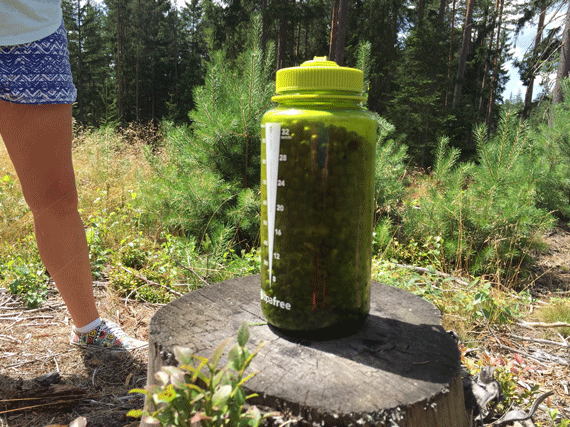 After lunch in the forest we spent 30 minutes picking blueberries, we picked 1 litre in this short amount of time which lasted us a week. Bliss, yum!